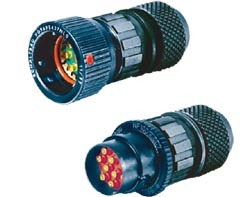 The Schaltbau Series of NF Connector with 7 or 10-way contact arrangements is specifically designed for high-density audio connections in communications equipment. A precision bayonet coupling and self-cleaning gold contacts facilitates utmost reliability under extreme ambient conditions. Watertight to IP68, the electrical connector maintains its seal even when uncoupled. Series NF10 and the shielded version of the NF07 have good attenuation characteristics with regard to electromagnetic influences, HF influences and pulse frequencies. Please add any number of items you wish to complete your quote. Once you have finished, please complete the details below in order for us to evaluate your quote.